The UNEP/PRI/Generation Foundation South Africa Roadmap [pdf] report is part of the Fiduciary Duty in the 21st Century initiative that aims to bring an end to the debate over fiduciary duty and environmental, social and governance (ESG) issues considered by responsible investors. The Roadmap, which is based on consultation with industry, provides various recommendations on how to ensure institutional investors integrate ESG factors into their investment decisions. Capacity constraints: capacity issues affect both asset owners and the FSB, which is seen as the “key regulator for advancing ESG factors in pension schemes”.The lack of a permanent, well-resourced secretariat of the Code for Responsible Investment in South Africa (CRISA) is also seen as a barrier to CRISA’s effectiveness. The Kigoda Responsible Investment Ranking 2017, which found considerable variation in the implementation of CRISA’s principles among ten of South Africa’s largest asset managers, supports this. Knowledge gaps: although awareness of ESG has increased, there are still considerable gaps in knowledge about how to implement ESG practices. Trustee training is seen as essential to fill these gaps. Structural issues: South Africa’s fragmented pensions sector means that investment consultants are extremely influential, but there is insufficient guidance on how trustees should interact with consultants. ii. review the implications of the size and structure of pension schemes on governance quality. b. The FSB should review investment manager mandates to ensure that they reflect the expectations for investment practice set out in Regulation 28.
c. South African industry associations and the FSB should provide practical guidance to trustees on interaction with investment consultants on ESG integration. The Code for Responsible Investment in South Africa (CRISA) should be supported with more resourcing and a permanent secretariat to enable its work on stewardship and responsible investment in South Africa. ESG issues should be a core competency in the National Qualification Framework for trustee training. Training and accreditation groups and industry organisations, such as Batseta and the Association for Savings and Investment South Africa (ASISA), should collaborate to provide training and raise market awareness of ESG investment approaches. 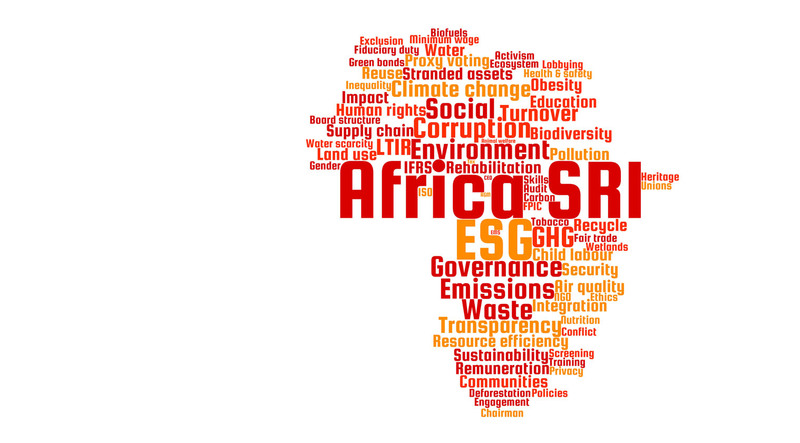 South African stakeholders, including the FSB and the Johannesburg Stock Exchange (JSE), should review the quality of the reporting of material ESG factors following the report of the international Financial Stability Board’s Task Force on Climate-related Financial Disclosures (TCFD). Kigoda Consulting has launched the Kigoda Responsible Investment Ranking 2017, which uses the Code for Responsible Investing in South Africa’s five principles and its practice recommendations to independently assess whether ten of the largest asset managers in South Africa have the policy frameworks and governance structures in place to implement sustainable and responsible investment, and to adequately disclose information on their responsible investment performance. These ten managers account for around two-thirds of total assets under management in South Africa by asset managers, including multi-managers. The Kigoda Responsible Investment Ranking 2017 is based solely on publicly disclosed information. A copy of the executive summary of the Kigoda Responsible Investment Ranking 2017 is available here.